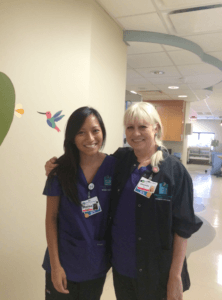 Meet Shaina Rivera, RN, BSN, a travel NICU nurse (pictured left). ATI Nursing Education interviewed Shaina about the ins and outs of travel nursing. Curious to see what her day-to-day is like? We were too! Tell us about your nursing career. I graduated from Research College of Nursing/ Rockhurst University in May 2012. I started my first job at Overland Park Regional Medical Center in their Neonatal Intensive Care Unit in July of that same year. I worked there for three years and then decided to start travel nursing in August of 2015. Since then I’ve had three assignments in San Francisco, California and one in Miami, Florida. In my short time as a nurse, I have experienced many different cases and types of newborns. I have worked with tiny 23-week premature infants, chronic children with tracheostomies, and full term chubby cheeked newborns. I have learned so much but I know I’ve barely scratched the surface of this specialty. How does travel nursing work? In the beginning of the process, you have a recruiter and you express to them what cities you are interested in going to. The recruiter sees what job options are available in or around that city, which they then share with you. The recruiter submits you for jobs after you decide from the initial list they have gathered. A phone interview with the potential job is the last step, and hopefully, you nail it and land the position. That’s the process in a nutshell. Choosing a recruiter from one of the what seems like hundreds of nursing agencies is a feat in itself. The paperwork is pretty tedious (resumes, skills checklists, references, diplomas, certifications, etc.). In the end, it is all worth it! You typically get 13-week assignments. If you like the assignment, you usually have the option to extend. If you do not, contracts are usually completed after three months and you can move on to finding another position. On top of getting well-paid positions, travel nurses get moving, housing, and meal stipends. It’s a great way to work and also to have fun and travel. It’s important to note that you can’t start travel nursing right out of school, most agencies/hospitals want at least a year of experience in a specific area of nursing, if not two years. Why do hospitals use travel nurses? From what I’ve experienced hospitals use travel nurses to fill vacant positions (temporary or permanent) and to save money. When nurses have to leave their jobs suddenly or are on maternity/paternity leave, it is faster and easier for hospitals to hire travel nurses to fill the void. They know travel nurses have the necessary skills to do their job and it gives them more time to interview prospects when they have to fill permanent positions. Hospitals save money because travel nurses get their benefits through their agency. How do nurses benefit from traveling to different hospitals? There are a lot of benefits from traveling to different hospitals. You get to see differing ways in patient care, different technologies, how different departments can be set up, employee satisfaction and involvement, policies and protocols, etc. Seeing different ways of doing the same thing from state to state enables you to decide what you would like to take with you as you grow in your nursing practice, and what you don’t. It will give you more ideas on how to improve each hospital you will work in in your future. What is the most exciting part of being a travel nurse? Even though it has become a cliche, I would say experiencing new cities is my favorite part of travel nursing. I lived in Kansas City for 25 years, born and raised (on a playground is where I spent most of my days). Don’t get me wrong, there’s no place like home (cause Kansas). But getting to see and experience other parts of the country, especially the coasts, has been very fun and rewarding. What is the toughest part of being a travel nurse? The uncertainty is definitely a challenge. When I graduated, I knew that I was going to work at Overland Park Regional Medical Center for three years because I was contracted with them. When I left and started traveling, I didn’t have a plan at all. I’m the type of person that had known what I was going to do for years ahead of time. Being a travel nurse, you only know what your life will look like for three months at a time. It scared me a lot at first, but with a year in, it has gotten a little easier. It does help to remind myself that there will always be a job somewhere that will need me. What are your next steps as a travel nurse? I am extended at my current contract in Kaiser San Francisco until March. Afterward, I have no solid plans but I’m looking to maybe go to Hawaii or Austin, Texas. What advice would you offer nursing students considering this career path? Do it, and go everywhere! And when you do, remember you’re stepping into a different hospital than where you worked before. No hospital policies or procedures are exactly alike. There are many ways to do one thing. Don’t act superior towards people that have worked there for years. Also, don’t buy a lot of furniture. It’s a lot easier to travel with just a couple of suitcases! How to Get into Nursing School: A 5-Step Guide Quiz: Is Night Shift Nursing For You?